I love the lazy days of summer and have been fully enjoying each one. It has been a long time since I updated this blog. I have been using the time to get healthy rather than doing anything craft wise. As long as I keep vegan and exercise everyday to de-stress, I do not have any Lupus symptoms. My rheumatologist is always amazed that I recover so quickly. I try to tell her that keeping vegan works, but the AMA doesn’t officially recognize it yet. I slipped up and was eating cheese again, feta is a major weakness. I think that is what caused me to flare and end up in the hospital. All forms of protein can cause flares; it is just that animal foods have so much. I am even watching how much wheat I eat. I have been spending quite a bit of time updating my recipe collection to be all vegan. Luckily, Rick and Alex like the vegan dishes I make. Hopefully I will be able to share some recipes soon. Even though I am not in the garden much, I have already been able to get 10 cups of basil for pesto. The tomato plants look healthy, but aren’t doing much right now. Here are a couple of photos. 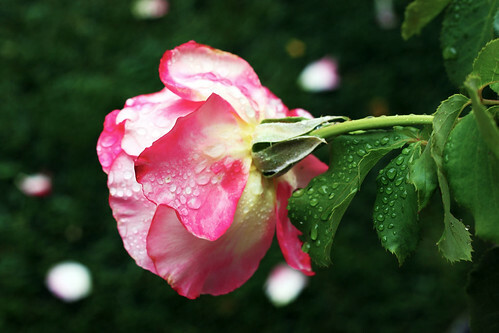 One is a rose bud in the rain, and the other is of one of my favorite flowers. 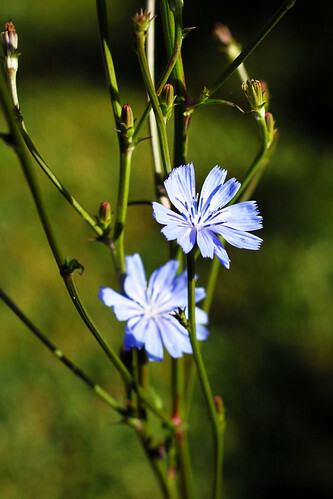 It is a chicory blossom. The blossoms do not last long, maybe 2 days, and are spaced out on 5′ tall stems. The humming birds seem to like them too and will perch on the branches to sip the nectar. I haven’t been fast enough to get a photo of that yet, though I have been trying. Rick has been doing some new sketches. He has just put them on his web page. I hope you like his work as much as I do. This entry was posted on Sunday, June 27th, 2010 at 1:56 pm and is filed under Garden, Life and Photography. Tagged: Garden, Life, Photo. You can feed this entry. You can leave a response, or trackback from your own site. I am trying to learn more about veganism as it relates to health. Thank you for this reminder that it does make a difference. Glad to hear you’re feeling better. Lucky you getting so much basil! So happy to see you posting and that things are definitely on the upswing! Love the delicate dew covered rose too. Your basil is miles ahead of mine…it is only about 2″ tall and I am thinning out the babies to use the tiny leaves in salads. Your info about protein is an eye opener…lately I have been wondering just exactly what the AMA does know – they keep changing their views every other month. We need to take care of ourselves as best we can. I’m happy you are feeling better. I planted 10 basil plants because we have developed a taste for Pesto, too. The flower pictures are lovely. I’m not good at photography–i guess I don’t look for those interesting details, like a dewdrop.